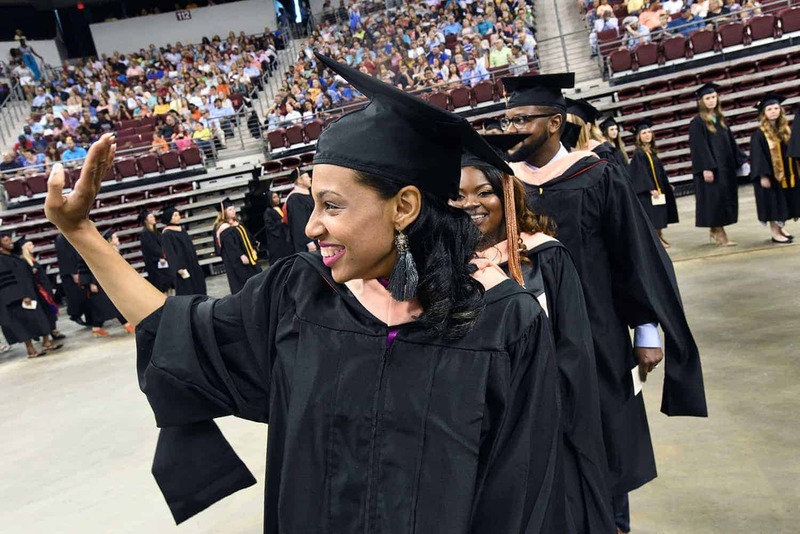 UAMS celebrated 969 new health care professionals at its 2018 commencement ceremony May 19 at Verizon Arena in North Little Rock. May. 21, 2018 | May 19, 2018 | Degrees and certificates were awarded to 969 graduates of the University of Arkansas Medical Sciences’ (UAMS) five colleges and graduate school May 19 during a commencement ceremony at Verizon Arena in North Little Rock. 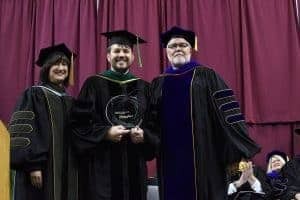 Degrees were presented to 157 in the College of Medicine; 282 in the College of Nursing; 111 in the College of Pharmacy; 54 in the Fay W. Boozman College of Public Health; 57 in the Graduate School; and 308 in the College of Health Professions. Interim UAMS Chancellor Stephanie Gardner, Pharm.D., Ed.D., presented the Chancellor’s Award to Joseph H. Bates, M.D., professor and associate dean for Public Health Practice in the UAMS Fay W. Boozman College of Public Health. 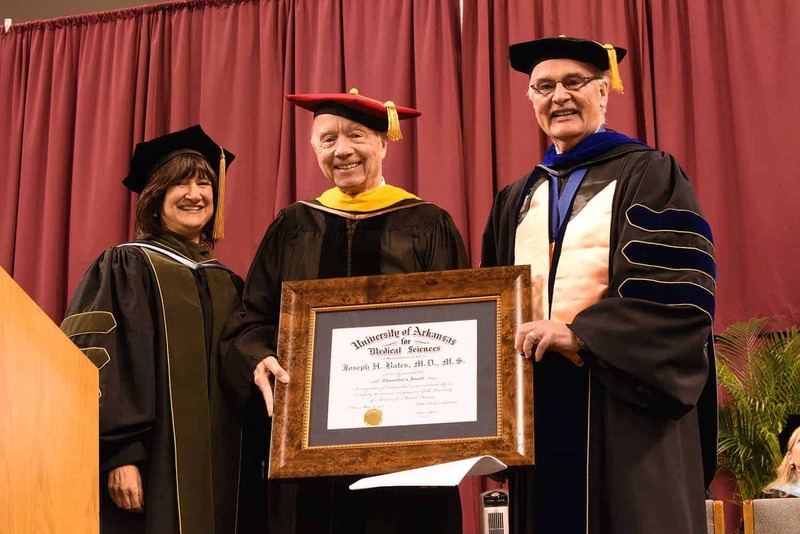 Joseph Bates, M.D., received the Chancellor’s Award. Bates is a professor and associate dean for Public Health Practice in the UAMS Fay W. Boozman College of Public Health. The award is presented to a person whose service to UAMS is deserving of special recognition. Previous recipients include Sam M. Dixon, former U.S. Sen. Dale Bumpers, Jack Stephens, Lawrence Schmieding and Willard and Pat Walker. Bates is recognized internationally for his research that greatly improved the understanding and treatment of tuberculosis. He spent 35 years at UAMS, including 21 years as vice chair for the UAMS College of Medicine’s Department of Internal Medicine. Upon his retirement from UAMS in 1998, Bates became deputy health officer and chief science officer for the Arkansas Department of Health. He was instrumental in establishing the Arkansas Center for Health Improvement and the UAMS Fay W. Boozman College of Public Health. Jerad Gardner, M.D., and Lanita White, Pharm.D., were the Chancellor’s Teaching Awards recipients. The awards program was established in 2004 to recognize excellence in teaching among faculty at UAMS. 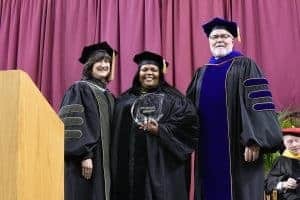 White was the recipient of the Chancellor’s Award for Society and Health Education Excellence. The award recognizes the design and implementation of courses or activities that advance the topics of society and health. It can be through areas of cultural awareness, health care economics, health equity, health literacy, health systems, interprofessional education, collaborative practice, public and population health, patient- and family-centered care or educational scholarship. 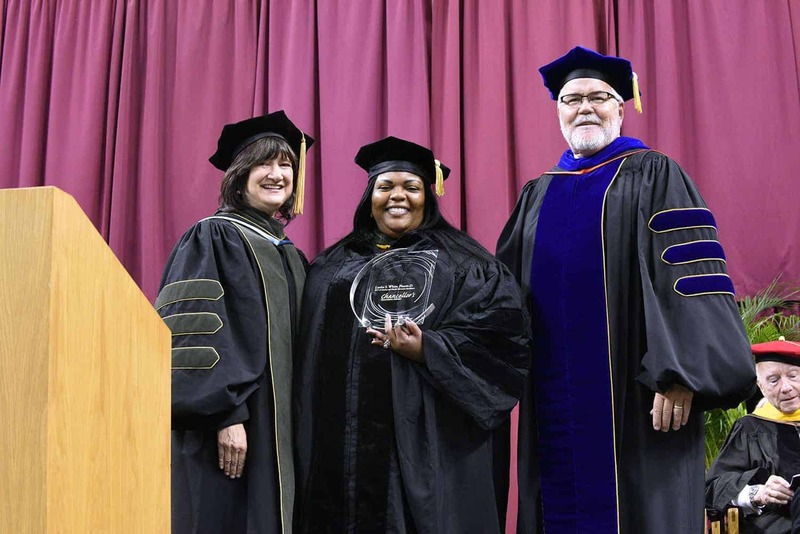 Lanita White, Pharm.D., received the Chancellor’s Award for Society and Health Education Excellence. White is an assistant professor in the College of Pharmacy. She directs the UAMS 12th Street Health & Wellness Center, a student-led, interprofessional clinic that offers free health screenings and wellness services to Little Rock’s underserved neighborhoods and populations. The center provides an opportunity for students from all UAMS colleges to volunteer, work with students from various health care professions and provide care to those most in need, all under the supervision of faculty and licensed volunteers. Last year, more than 1,000 UAMS students volunteered at the center. White was a finalist for the Arkansas Business Health Care Heroes Award in Innovation in 2016. She also won the Arkansas Medical, Dental and Pharmaceutical Association’s Dr. Jocelyn Elders Living Legend Award that year. Gardner was the recipient of the Chancellor’s Award for Teaching Excellence. It recognizes direct teaching, mentoring or educational scholarship between a faculty member and any learner. It can be in all settings, including the classroom, online, clinic or laboratory. Gardner, an associate professor in the College of Medicine’s departments of Pathology and Dermatology, is known nationwide for his presence, teaching and patient advocacy on various social media outlets. 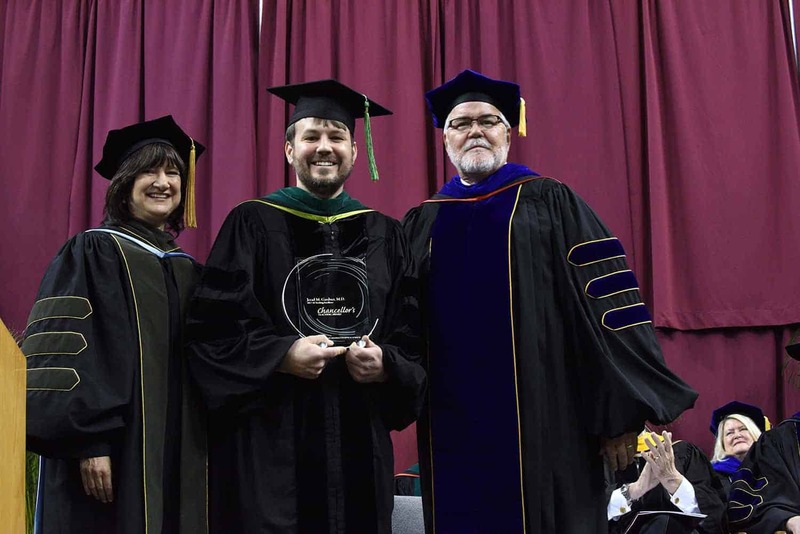 Jerad Gardner, M.D., received the Chancellor’s Award for Teaching Excellence. His efforts have garnered him numerous awards and praises, including the College of American Pathologists Resident Advocate Award in 2015. He is the youngest recipient of the award. In 2017, he was named a Top Five Honoree on the American Society for Clinical Pathology’s “40 Under 40” list. During commencement, degrees and certificates conferred include the doctor of philosophy, doctor of medicine, doctor of pharmacy, doctor of nursing practice, master of science, master of nursing science, bachelor of science in nursing, master of public health, doctor of public health, certificate in clinical and translational science, master of health administration, postbaccalaureate certificate in public health and a variety of degrees in allied health disciplines including certificates, associate and bachelor of science degrees, postbaccalaureate certificates, master of imaging sciences, master of physician assistant studies and doctor of audiology. The following graduates received their Doctor of Medicine (M.D.) degree. The following graduates received either a Bachelor of Science in Nursing (B.S.N. ), a Master of Science in Nursing (M.N.Sc.) or a Doctor of Nursing Practice (D.N.P.) degree. The following graduates received their Doctorate of Pharmacy (Pharm.D.) degree.